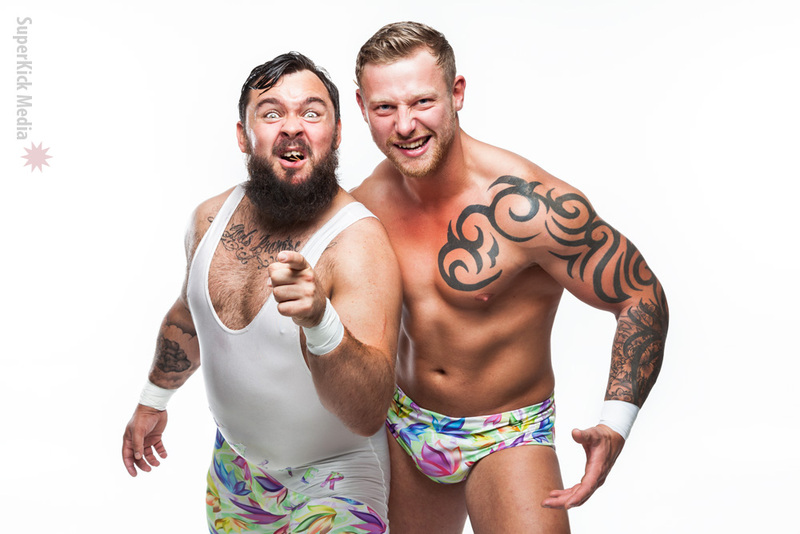 Following on from the last session with Kay Jutler, I was re-joined in the studio by the incredibly successful British wrestling tag team “The Magnums” to shoot more physique and character portraits. The lads previously visited me in the studio around a year ago but have returned to update their image library having worked hard on their physiques and gaining new attire. It’s interesting to see how the team has evolved over the year – the fun and silliness is still there but it’s taken a bit of a back seat. You can tell that their whole act has been slightly more refined, bringing with it a focus on their in-ring ability and not just panto skills. 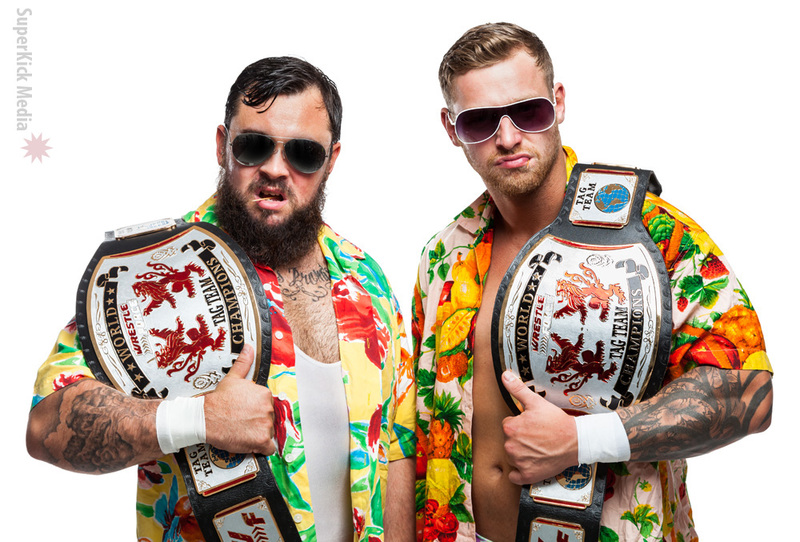 In the time since we last worked together the team has gone from strength to strength, at one point being Tag Team Champions in no less than three promotions at the same time. We had a lot of fun in the studio and the self-confessed sleaze-bags did not disappoint, giving their all in front of the camera. 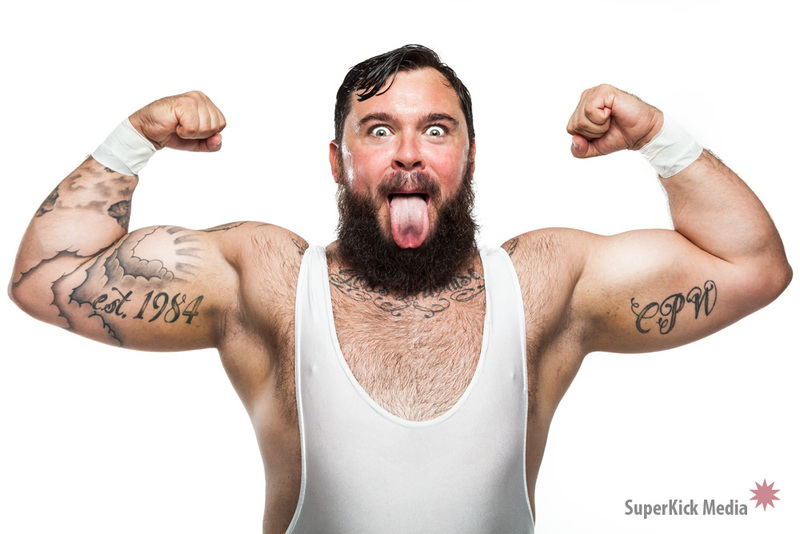 Being as much a performing art as it is a physical one, it really surprises me just how awful the majority of wrestling portraits are. (Well actually, it doesn’t surprise me but it’s time we changed this.) Take a look at a show poster and quite often you’ll see flat, one dimensional characters looking back at you. 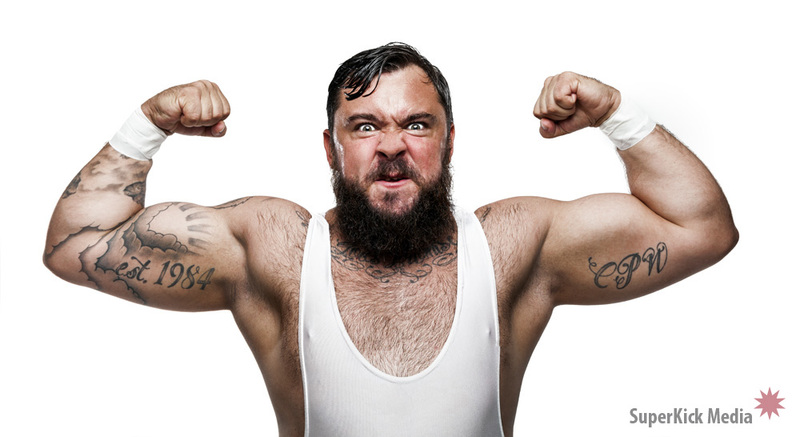 I understand that in modern pro wrestling it’s not so clearcut as it used to be: not everyone is a superhero or an arch villain these days thanks to anti-heros and tweeners (excuse me while I vomit…) but it’s important to live up to your gimmick and breathe some life into it. The truth is that there is no time more important to live your gimmick and let your personality shine through than at your photo shoot. At least in the ring you can distract people with the action. The photos that get created will be used on posters that people will see. People including other promoters. The people that book you. Working a photo shoot is just like working a match under a hood: it’s all in the sell. It’s all visual. You need to be the larger than life character that people want to pay to see. On show posters villains should look like they will jump out of the photo and strangle you. “Looking hard” down the lens just doesn’t cut it. Babyface’s should look friendly, welcoming and heroic. They shouldn’t just look like one face amongst many. This isn’t always the photographer’s fault either – quite often these portraits are shot back stage at a show where the talent is about to go out to perform in about 5 minutes time so the best the photographer can do is point say something like “just stand there for a sec *click*”. 1. The photos belong to the promotion and not you. Since they paid for them, or at least went to the effort of arranging the shoot, you can’t really share them to other promotions to use. You can’t get on other posters so you won’t get your face out there. You won’t get as many bookings. 2. The traditional approach of photos 5 minutes before your match and “just stand there a sec” isn’t long enough for your personality to come through. Working a photo shoot takes a bit of time and effort. You need to relax, connect with the photographer, who will coach you through the process. I stopped doing 30 minute bookings for this very reason – the best photos come in the last 20 minutes of the hour. This approach doesn’t do you any favours. During my sessions I always shoot both face and heel portraits for added flexibility – you certainly can’t do that in 5 minutes. 3. Backstage “studio” setups are usually pretty bad: terrible locations, bad lighting, and usually the “photographer” is some guy helping out and doesn’t really know what he’s doing. He just has a half decent camera that he shoots in auto. Take yourself seriously: You’ve invested time and money into your look, your fitness, your gear, tanning and training. Get yourself some solid portraits that you can use for posters and market yourself more effectively – they will pay for themselves when sold as merchandise, you’ll get more bookings in the long-run and take your career to the next level. Let me help you out: worker-friendly prices are available.